Sony NWZ-E585 Walkman is a small and compact aluminum body with subtle and refined, able to ensure a clear sound with enhanced bass thanks to Sony Clear Audio technologies. Of particular interest is the technology of digital noise, which removes ambient noise and lets you listen to music in peace even in crowded places. The reader is also provided with normalizer, 5-band equalizer, an autonomy of 77 hours of audio listening, USB port, 2-inch TFT display, FM radio, voice recorder and ear headphones supplied. The Sony NWZ-E585 is a media player in a compact, slim and stylish, thanks to its elegant livery. It has a TFT display with LED backlighting and 2 inches with a resolution of 320×240 pixels. As for size, measuring 92 mm in height, 41.7 mm width and 7.5 mm thickness. The weight is only 49 grams. 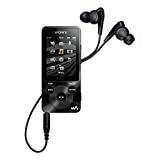 The Sony NWZ-E585 is the latest model of mp3 player presented by the manufacturer this year. It is a walkman small and compact, which ensures high-quality audio and presents an excellent relationship between quality and price, as indeed all the models in the E series from Sony. This player has a combination of proprietary sound technologies, including stand ClearAudio mode, which lets you hear every detail of the music, without losing anything, or eliminating digital noise, which removes ambient noise allowing you to concentrate only about music. Do not miss the Clear Bass and 5-band equalizer. Speaking of purely technical details, the Sony NWZ-E585 has an internal memory of 16 GB on which you can store up to 3700 songs in mp3 format. It also supports audio files in various formats such as WMA, AAC-LC, Linear PCM and MP3 course. It also supports image files in JPEG format and the video in MPEG4, AVC, and WMV9. The player also has an FM radio, with up to 30 station presets, and supports voice recording. Very cute SenseMe is the mode that allows you to combine your favorite songs according to your mood and have the playlists always at hand. The Sony NWZ-E585 is also equipped with a USB port to quickly transfer songs from PC via a drag and drop, a TFT display with LED backlight 2 inch and different search modes and music playback. With regard to autonomy, the reader is equipped with a lithium battery that provides up to 77 hours of continuous audio playback, and it takes 4 hours for a full charge. Finally, the purchase package includes rechargeable battery, USB cable, earphones, and quick-start guide. The Sony NWZ-E585 is an interesting media player that supports audio, video and images, and to ensure a high level of sound quality, all at an affordable price. Several audio technologies used, including the suppression of the noise, allowing you to isolate themselves from the outside and focus on the songs you listen to. The battery life is very excellent and easy to use and intuitive. A good reader base. Where to Buy Sony NWZ-E585 Walkman? PROS : FM radio; 5-band equaliser, In ear headphones supplied, Voice recorder, Support pictures and videos, Clear Audio Technologies, Design, Noise suppression. CONS : No recording from the radio, No Bluetooth, Size and display resolution.